The Surface Pro 4 is an answer to many people’s wish list of being able to use your tablet like a laptop. It is as light as a tablet but has all functionalities and features of your regular laptop and more. With the superior advantage of Microsoft, the quality of the hardware is simply indisputable. This is exemplified in the highly effective and user-friendly stylus. Over heating of the machine. A tricky keypad, which, has the delete, and power buttons dangerously close. The SSD storage options are available in 128 GB, 256 GB, 512 GB or 1TB, based on your usage, apps downloaded and requirement. You also have options in the 6th Gen Intel processor, of m3, i5 or i7. 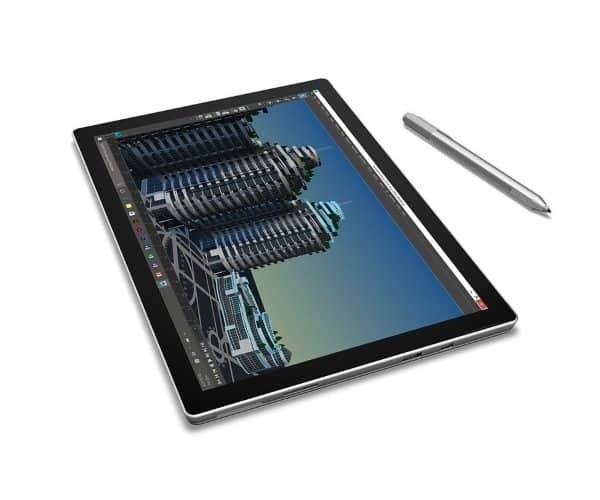 The Surface Pro 4 comes with a full sized USB port, micro SD card reader, Headset Jack, Mini Display Port, Cover Port and Surface Connect, making it seamless in terms of device connectivity and compatibility. In terms of the AV output, the Surface Pro 4 comes with a 5.0 megapixel front facing camera and 8.0 megapixel rear facing camera, stereo microphones and speaker with Dolby sound. 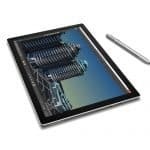 Another feature worth mentioning is the support that it offers to write directly into webpage with the help of Surface pen which renders note sharing an effortless process. It is also designed ergonomically and comes with an easily adjustable stand which helps to offer coziness while you are working. The USP of Surface Pro is Windows Hello, facial recognition software which is in-built to Windows 10 Operating System. 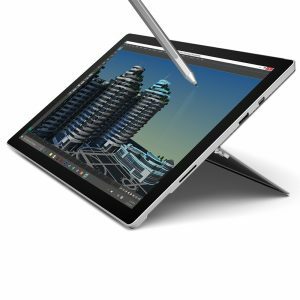 It also comes with a couple of functionalities which adds value to Surface Pro – Click on the eraser button to open up One Note at the drop of a hat. To take screenshot, double click on Surface Pen and you could also pursue other activities like cropping images. Looking for virtual assistant ? Hold down the eraser button to open up to Cortana, your worthy assistant who could help you perform multiple tasks like searching, setting alarms etc. The Surface Pro 4 definitely carries the Microsoft advantage over other tablets as it can run your desktop software, just like your laptop. A dream for audio-visual buffs and professionals it helps in streaming videos and music, while organizing and editing photos. You can do lots of great stuff in terms of music on this tablet which you would never dream of doing on a regular tablet. Its USB port and graphic card reader also make it very attractive. However you can’t depend on this as your main tool for storage and functioning and if you aren’t too much into music and movies, but using it for only official purposes, then this might be a tricky one for you to consider.